Model #: APC3012D Click to view the whole line. 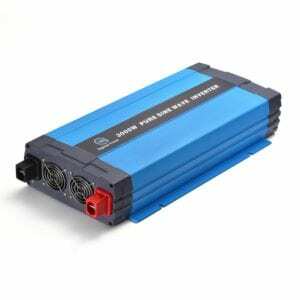 This 3000 watt 12v to 120/240 Volt Pure Sine Power Converter is a combination of power inverter, battery charger and AC auto-transfer switch with a peak DC to AC conversion efficiency of 88%. This Sigineer Power 3000 watt Pure Sine Power Converter changes 12Volt to 120/240Vac Pure Sine Wave output. It is an inverter that converts 12V DC (direct current) power into 120/240V AC (alternating current) electricity to power tools and appliances. The battery-type selector on the top of the 3000 watt Pure Sine Power Converter allows the ability to adjust the charging voltage to the battery bank. This 3KW 12V inverter and converter is built tough and ready to operate to its fullest extent.